7 birds are sitting on a wire. 2 birds decide to fly away. Improve your customer service without breaking the bank! 5 It needs to fit our budget! Everything you need to get your customer service culture started on the right foot! This is the complete customer service training blueprint. 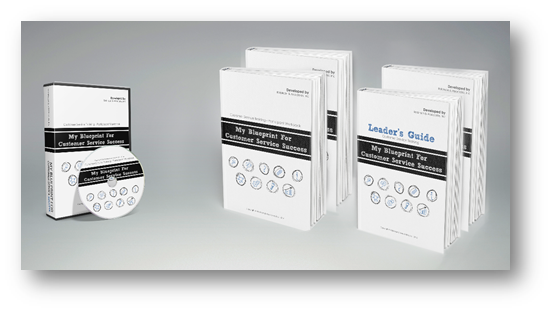 From the Leader's Guide, to the actual PowerPoint and Participants’ Workbook. 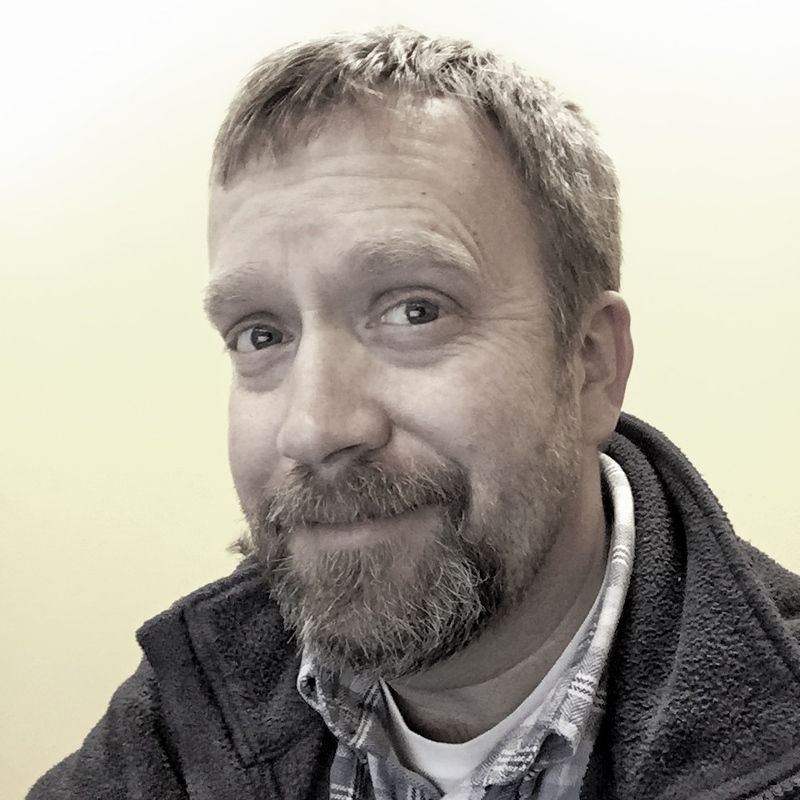 Leaders – My Blueprint Video: Provides facilitators a detailed walk through of each of the slides in the training and as well as some of my favorite tricks and tips! 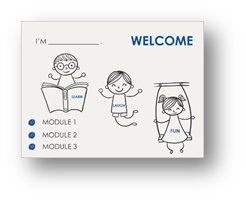 Participant Workbook – This fun and easy to follow participants’ workbook was designed with a learner’s perspective in mind. It’s graphical to increase retention and provides areas to write down key points. 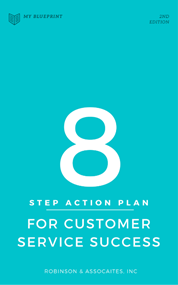 My Blueprint for Customer Service Success is packed with all the information and tools you need to kick off a successful customer service initiative. Some clients want even MORE! They want to develop the people that will facilitate their service improvement initiative and they want to learn from the best. This is not a $399 generic course! This is designed to be a life changing experience. Train the Trainer is 5 days of intensive learning. We offer this bonus to make TTT even more affordable for My Blueprint or Customer Service Excellence participants. Research done by Harvard and the London School of Economics found that a person’s willingness to risk their reputation is the number one way to predict future growth of a business. 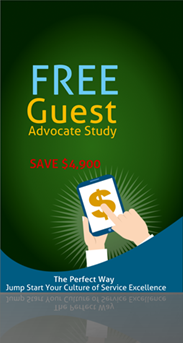 We know this information is so valuable that we’re including a FREE baseline Guest Advocate Index study of your current guests. This is a complete study and you’ll know exactly where your casino stands at this moment. It’s the ideal tool to use prior to kicking off your customer service improvement program so you know exactly where you were before your service improvement initiative started. 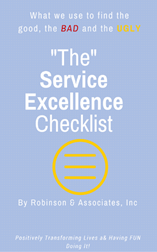 Create a crystal clear vision of service excellence and what that will do for you and your team. Uncover hidden challenges that may be sabotaging your customer service efforts and keeping you STUCK. Leave this session renewed, inspired, and ready to ﬁnally create the culture of service excellence you want-- once and for all. All great accomplishments start with the same thing… a PLAN. Don’t let the simplicity of this 8 step plan fool you. It’s designed to make it easy to get started and more importantly easy for you to reach your goals. The difference between a goal and a wish is having a plan. Your goal is customer service that is memorable and brings your customer back time and time again. The key is having a plan to accomplish it! These are 25 of my favorite tips for facilitating amazing customer service training! I’ll even include my PowerPoint for this! One of my favorite tips from this is… 144 characters. That’s right, you need to think in tweets not paragraphs! 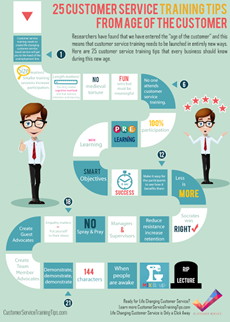 Post this up in your department or at your desk as a constant reminder of the 25 Customer Service Training Tips! 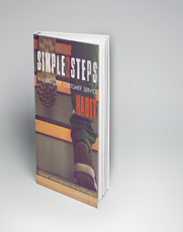 My Playbook How to make customer service excellence a habit! 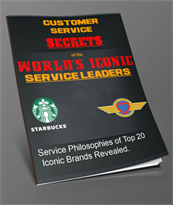 The super secret and simple proven 2 step system to create a customer service excellence habit! 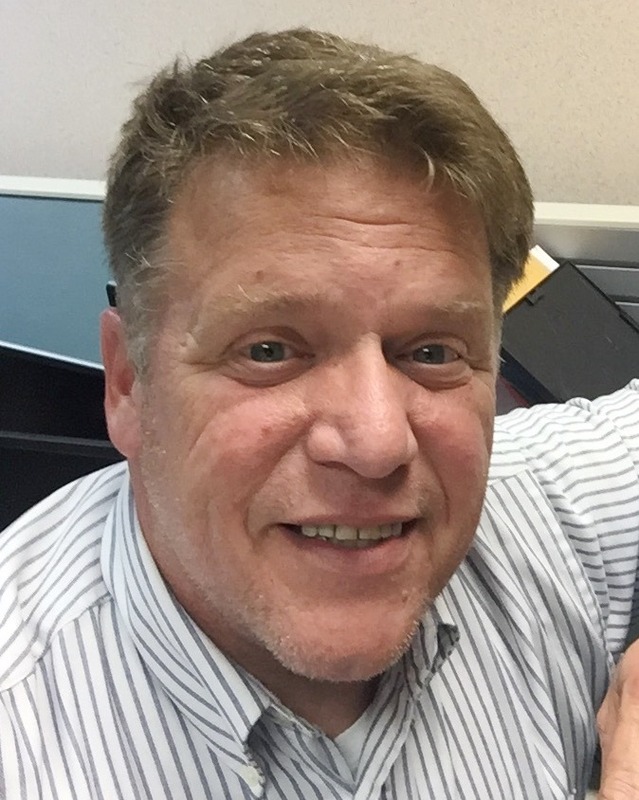 You know that you don’t want to just train your team members… you want them to make amazing customer service a habit that they do every day during all shifts. This provides the secret to building habits that last because it leverages existing habits! Did you know that researchers found that it takes on average 28 days to make a new habit. This awesome hack reduces that significantly! What do the world’s best companies do to provide excellent customer service? What are their missions and service standards? 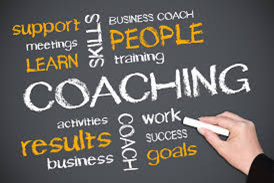 Don't re-create the wheel, learn what is working for the very best in customer service like; Nordstrom, Southwest Airlines, Zappos and 10 more top performers. ACTION: This is a quick read and a perfect way to get in a “customer service” state of mind. Before your session, pick a story or two to refresh your mind of the “greats” out there and know that your property is becoming one too. 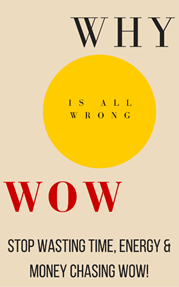 Why “WOW” is ALL Wrong! Stop wasting money, time and energy chasing WOW. WOW is a very costly customer service mistake! Customer Service books all have words like; WOW, Great, Delight and Excellence in the title but researchers show they are a waste of money and are a detriment to your company’s profit potential. It’s not about the words but how human brains are wired! Yes, you read this right…This is over $10,000 in bonuses! What does a lost customer cost your casino? What would it be worth to have more customers telling family and friends how great your casino is? What would a 2 point increase in your Advocate Index score be worth? What would having more positive online reviews about your casino on sites like Yelp, Google & Trip Advisor? For everything you just read about it’s less than we charge for one day of onsite training! No, that’s not a typo. We want as many casinos as we can to take advantage of this and take their service to an entirely new level. We knew that if we made the price this low, casinos would be crazy not to say yes and do it now. As I said this is only available for the next 36 hours. Get Instant Access to My Blueprint! 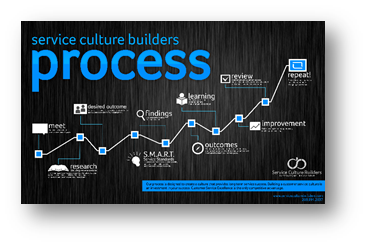 So CLICK NOW to get your complete customer service improvement blueprint! 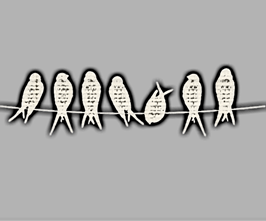 7 birds are on the wire and 2 decide to fly away…how many are left? The answer is 7. Making the decision is not enough. You need to take action. This is an extremely limited time offer. Take action now and get started creating the culture of service excellence you know you need for long term success. P.S. Do it now! 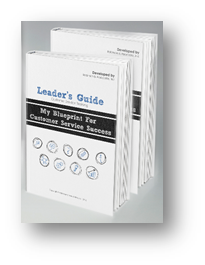 Get “My Blueprint for Customer Service Success”. Get the training materials you need for long term success. Get Instant Access to Blueprint! 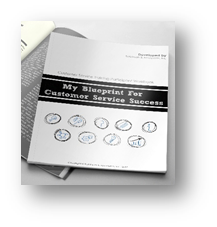 So BUY NOW to get your complete customer service improvement blueprint! We’ll do everything we can to make you 100% happy, and I’m sure you will be! Get My Blueprint for Customer Service Success and try it out for yourself and make sure it gives you the tools and training you need to improve your customer service and that you’re 100% happy with your decision. If you don’t love it, just return the program within the first 30 days of your investment and we’ll issue you a full refund. No questions asked! And keep all of the bonuses as our gift to you. No these are not mindless videos that you plop in and have your team members sleep through. Research shows that learning is not passive… like watching a video. Learning and more importantly retention increases with activity. This is a proven active learning system that you customize to make it unique. The investment is less than we charge for one live session and have unlimited use of it! Think about this… if one team member gives one of your top players better service and they come back one more time in the next year the Blueprint paid for itself! This is an amazing opportunity for your organization. What do we we need to develop? The development and creation is DONE. You’ll get it all in electronic format so all you need to do is start the powerpoint and print out the team member work books. But wait if you want to customize it you can! As a matter of fact we encourage it. Add your logo, purpose, service standards! Can you train us on how to deliver this to our team? 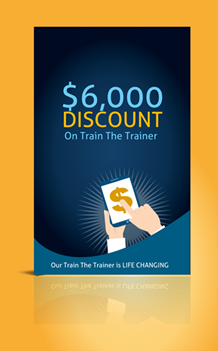 Yes, we offer an amazing Train The Trainer program. As a matter of fact it has been called “life changing!” If you’d like to know more please give us a call 208.991.2037 we’d be happy to learn more about your needs. We offer no-questions-asked refunds to all customers within 30 days of your purchase. If you are not satisfied with our product, then simply send us an email and we will refund your purchase right away. Our goal has always been to create a happy, thriving community. 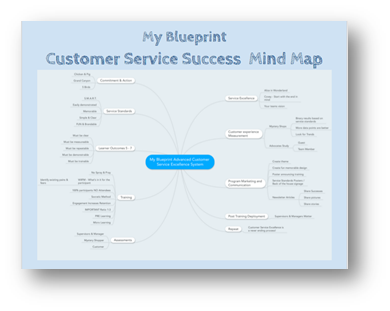 If you are not thrilled with “My Blueprint for Customer Service Success” just give us a call.